breathe out what I have to offer life. REMOTE GALAXY (Philharmonia Orchestra - Vladimir Ashkenazy) was nominated for a Grammy 2015 in the category Best Surround Sound Album. — 2L und der Exzentriker Flint Juventino Beppe passen als kongeniale Partner perfekt zusammen. Sowohl Label als auch Komponist machen ihr gänzlich eigenes, hochambitioniertes Ding in technisch und klanglich außergewöhnlicher Klasse. — This full force of creativity is expressed in the music through huge explosions of sound and power, alternating with moments of serene peace. — Vladimir Ashkenazy is conducting a stunning Philharmonia Orchestra, which manages to bring out the turbulent dynamics and occasional ferocity of these compositions in an outstanding manner. — Beppes Musik ist die Musik eines hochbegabten Autodidakten, und als solche weit entfernt von allen historisierenden Zuordnungen. Sie berührt auf verwirrende Art, entzieht sich der Kategorisierung, mischt das Anachronistische mit dem Visionären, vermeidet jede Konvention, ohne dabei prätentiös oder avantgardistisch zu werden. (...) Neben dem Philharmonia Orchestra glänzen drei Solisten auf diesem Album: Ralph Rousseau an der selten in moderner Musik gehörten Viola da Gamba, Mark van de Wiel mit seinem schlanken und präzisen Klarinettenspiel, und Emily Beynon an Beppes Lieblingsinstrument, der Flöte. — The music is tonal and melodic, but derivative of absolutely no one; it's spectacular without seeming gaudy or even cinematic (although I could imagine sections from several of these pieces accompanying a yet-unborn Tim Burton film). — This program of mostly 21st century music will be extremely accessible to all audiences. I got the recurring notion that a number, if not all, of the pieces in Remote Galaxy could be construed as "soundtracks" for our times. I would not be surprised to see some of them eventually turn up as bits or entire selections in future films. While I was unaware of Flint Juventius Beppe's body of work before I reviewed this disc, I will be looking forward to future works from this obviously talented composer. — There's a lot of music here - in both size and scope. — Vladimir Ashkenazy, beinahe doppelt so alt wie der Komponist selbst, ist dessen Musik hörbar wichtig: Die vibrierende Energie, die der Altmeister ihr verleiht, ist sofort spürbar. – Die Klangqualität ist selbstverständlich auch bei dieser 2L-Produktion exzeptionell! (2013). — This album takes you to the unique journey of dreams and self discovery. It's a vibrant, cognitive traveling. Like a grand story unveiling with each song creating a short musical essay of its own. FLUTE MYSTERY (Philharmonia Orchestra - Vladimir Ashkenazy) was nominated for a Grammy 2010 in the category Best Surround Sound Album. — Fred Jonny Berg [Flint Juventino Beppe] is a major musical discovery. It would be necessary to rewind to the 1940s and Malcolm Arnold to find an emerging composer of such exceeding promise. His compositions are confidently tonal, fluently melodious and possessed of virtually supernatural penetrative power. The flute works receive achingly beautiful, indeed enchanting, performances from Emily Beynon and the Philharmonia under Vladimir Ashkenazy (Berg conducts the other pieces). This set is recommended for any collector seeking the refined side of contemporary music. — Listening to this disc introduced the writer to the pleasant new discovery of the music of Fred Jonny Berg. This innovative Norwegian composer (born in 1973) has written prolifically for a wide range of instruments and instrumental combinations, including the flute and flute family, with compositions being dedicated and performed by such esteemed flautists as James Galway and Emily Beynon. His works are accessible yet distinctive, are largely tonal, colourful and melodic with a convincing emotional pull. The originality of his music can perhaps be linked to his wide experience in range of other areas such as film making, writing, directing and singing. 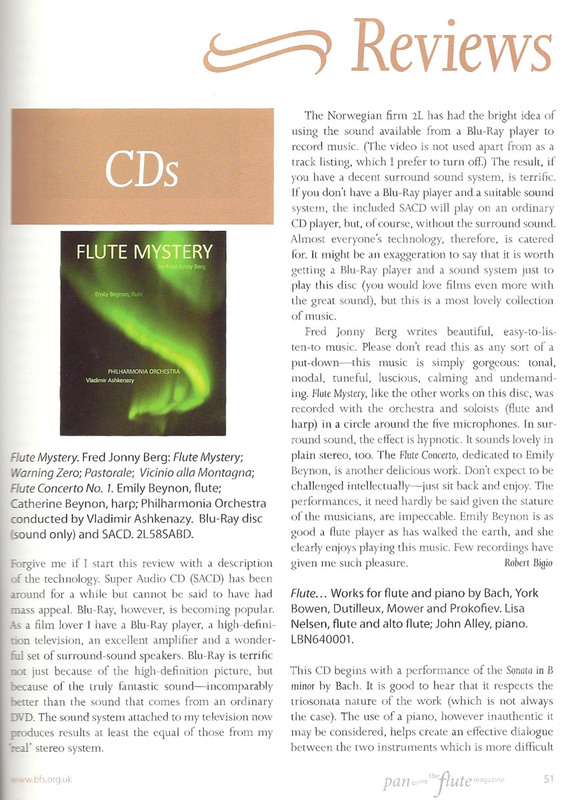 — One of the high rez albums that stood out was the Flute Mystery by Fred Jonny Berg (2L, available as a two disc SACD and Blu-ray audio-only pair), an album I learned about thanks to the members of the CANADA HiFi forum. The moment I began listening to this album it transformed my room into a sonically magical, fantasy land. The surround mix of this performance is just wonderful, with carefully chosen instruments directed to the surround channels. Rather than sounding gimmicky, this surround experience raised my enjoyment to a truly higher level. (...) This is without question the best sounding orchestral surround disc I've heard to date – a must have for classical music fans. — The performances, it need hardly be said given the stature of the musicians, are impeccable. Emily Beynon is as good a flute player as has walked the earth, and she clearly enjoys playing this music. Few recordings have given me such pleasure. — Berg's musical paintings were brought to life by none other than the great Vladimir Ashkenazy leading the Philharmonia Orchestra. The performances match the compositions beautifully, covering the whole dynamic range from very quiet to thunderously majestic. (....) 2L has done it again. With beautiful renditions of Norwegian Fred Jonny Berg's music that have been flawlessly recorded, one can sit back and enjoy the visuals flashing by the inner eye while being surrounded by a fabulous sounding orchestra. As an avid film lover with a large number of movie scores in his CD collection, but also as a classical music aficionado and someone who appreciates well done surround recordings, I can only highly recommend this Blu-ray Audio Disc. Reference quality! — Music by Norwegian composer Fred Jonny Berg is featured on this CD. The impressive quality and clarity of the recording immediately stands out, portraying Beppe's expressive and rich language in the best possible way. — The aptly named 'Flute Mystery', the work that opens this programme, has an ethereal quality and immediate appeal due to its strong melodic content and transparent orchestration (flute, harp and strings). The outstanding principal flute of the Royal Concertgebouw Orchestra, Emily Beynon, and her sister the harpist Catherine Beynon play this ravishing piece with consummate skill, while Ashkenazy and the Philharmonia's accompaniment is wonderfully refined. 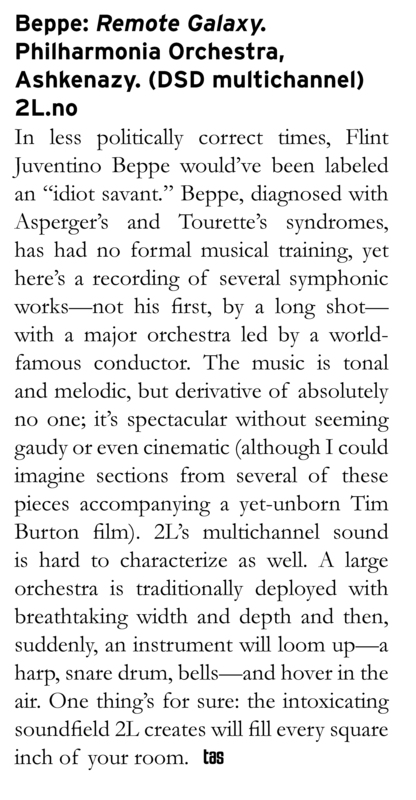 — Bergs piece alluding to the mountains is from a score he created for a film with the same title. He depicts mountain panoramas in his own way, and rather than the alpine peaks of some romantic composers, his are the rougher peaks of northern Norway. The Flute Concerto returns to something of the quieter and more contemplative mood of the opening piece. An impression of calm pervades the music without the use of minimalism or other modern devices. — Beppe's original, soulful and richly rewarding music is brilliantly performed on this ground-breaking recording. — Sebbene sia affetto dalla sindrome di Tourette e da quella di Asperger, Berg (che ultimamente ha deciso di farsi chiamare Flint Juventino Beppe, nel suo sito web spiega i motivi di questa scelta) è riuscito a realizzarsi e a esprimere la sua sensibilità attraverso la creatività musicale che rifugge gli stilemi dello sperimentalismo e della frammentazione sonora per esaltare, al contrario, una sorta di piena rivalutazione del linguaggio tonale. — This is a very enjoyable CD to listen to – luxurious in flute and orchestral sound. — By including all three digital albums in one review, I had intended to be fairly brief but, such are the attractions of the works recorded here, I make no apology for providing a much longer blog than usual. — For Berg is a composer with a very original way of writing tonal, approachable music, using diatonic, polytonal and modal harmonies, building effective spans of tension and release, able to produce powerful, driving and energetic music (the film music Vicino alla Montagna which depicts the rugged mountains of Norway and the giddily threatening Warning Zero) as well as to conjure soundscapes of mystical calm and peace (Flute Mystery and the concerto, written for and premiered by these forces just six months ago). And all without a hint of minimalism or neo-romantic pastiche. — Galway formed a sinuous bond with the orchestra in the world premiere of Norwegian composer Fred Jonny Berg's "Flute Mystery," Concerto for Alto Flute and Orchestra. Berg writes music of a spare beauty. The 15-minute, one-movement piece merges cool restraint and rhythmic exactitude. Galway, to whom Berg dedicated the score, played his languid lines with sympathy and dark polish. — Fred Jonny Berg has given the world yet another timeless classic piece with Flute Sonata no.1 op.40 and should be heralded for his tremendous effort and choice of musicians for this grand masterpiece! — The music grasps me because it is a structured piece that has an improvised feel. The music starts off in one direction that soon changes from rhythm-bound to free-track in one moment, before it restructures itself in a adagio part that sounds like random themes put together, only fooling me until I have a second listen; there is structure, one level up. — There are several elements in this piece which makes classical music shine throughout! Not only does this music make the genre itself more exciting, but it will surely prove to electronic-only fans that classical is a genre to behold for its honesty, richness, and imaginative nature. All this, with just a piano!! It is amazing that so much emotion can be thrown into one piece of music. With all this emotion in there I find it hard to believe that a track of any kind would make any sence. But it seems that here too Fred Jonny Berg scores. He has managed to keep the structure intact, and the whole thing flows very nicely. (…) In today's world, we have with almost no exception "freedom of speech." I believe that this right is equally so for music, and if Fred Jonny Berg "has a dream" I'll be sure to listen. — This is a fresh and individual voice, always direct in communication with the listener and yet with many surprises. I look forward to performing it in it's home territory. — Fred Jonny Berg well understands the expressive possibilities of the flute, and writes charming and appealing music for it. He has a style of his own, which is characterised by twists and turns and sudden flashes of colour. — Fred (or Jonny, whichever he prefers) has managed to extract the freedom and flexibility from that minimalism, seeing it more as a cause for intimacy than a barrier to complexity. And by God, it works well. Listen to this whether you're into classical or not. Amazon, 2004 "Montagna con Forza"
— Fred Jonny Berg's music reaches into your heart and soul, and it presents you with many surprises. The music is fascinating - that is what is essential to me. It creates reactions and is appealing. I know that an increasing number will become aware of this special and talented composer. — For a long period of time and at the same time being increasingly overwhelmed, I have followed the composer Fred Jonny Berg's artistic undertakings. For fifteen years, I have known him as one of the most talented Norwegian composers of his generation. His will to innovate and be creative is quite astonishing. His multi faceted intellectual and proficient technical background have made him capable of integrating modern techniques into his art like few others have done before him — without making the music sound artificial or pretentious. He has been able to combine more conventional settings that result in highly original outcomes. He has always avoided being trapped inside the complexity of –isms; thus he is indisputably one of the most inspired and original Norwegian composers of today. Fred Jonny Berg is one of the first Norwegian composers that has fully understood how to unite motion pictures with the soundscape of classical music. Lately, he has been working on how to implement his strongly visual music into the film medium. W. Plagge, pianist & composer, 2004. — Berg was rewarded with extended and heartfelt ovations, and one could hear shouts of bravo […] Fred Jonny Berg's compositions need no preconceived code or explanatory introduction to gain support. The music's inner ambience is easily accessible for everyone. […] Fred Jonny Berg's symphonic poem «Theh Goldest» ends with soft harmonies. A loving and sanguine mood sneaks into the listener's soul. As the music ends one needs to inhale deeply: Beautiful! The world premiere of Berg's work was a success. Keskisuomalainen, Finland 1998. Translation: Vesa Jäntti. After a concert with Jyvaskyla Sinfonia. — At times, the music and the pictures are so intensely beautiful that you just have to close your eyes and relish the moment. You feel chills down the spine, become warm and smile, while the music grasps your very soul and captures you. — He [Beppe] manages to produce credible moods, and he provides great moments to those who listen with an open mind. [...] I would not be surprised if he is given a considerable place in history books when the story of contemporary music is written. Beppe believes that there is a short path from dream to reality in his life and music. We may dream that new music and the audience will become closer connected in the next century. I feel more reassured of that after this concert experience. Helgeland Arbeiderblad, 1999. Review of concert with Vefsn-ensemblet. — The atmosphere after the concert was electric, and the work definitely brought forward something brand new, yet it communicated. I hope to hear it again on later occasions.